In the 1850s, as what would become the Dakota Territory grew in population and industry, townsites were claimed in hopes of profiting on the westward expansion. Dakota City was one: at the confluence of the Sheyenne and Red Rivers, opposite Lafayette, Minnesota, it hoped to grow and flourish. Today, it no longer exists. The location of Lafayette (which also no longer exists) is well documented, but the original location of Dakota City is still inconclusive. 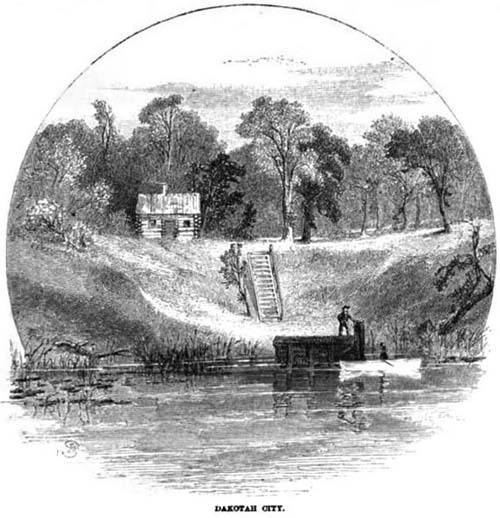 Image above from an 1860 edition of Harper’s magazine, documenting a pre-Territory trip along the eastern border of Minnesota, a freshly-minted state at the time. This entry was posted on Monday, September 14th, 2009 at 10:52 am	and is filed under Uncategorized. You can follow any responses to this entry through the RSS 2.0 feed. You can leave a response, or trackback from your own site.